I began teaching at Williams in 1990, while I was completing my dissertation from Yale in American Studies. My PhD thesis, “Seeing Through Doing Good,” took as its point of entry the evident obsession of 19th-century U.S. writers with the performance of charity and its limits. In the era of reform mania, mainstream magazines were a key stage for writers — both canonical and anonymous — to describe and critique individual displays of disciplinary affect in evidence everywhere around them. In so doing, these mostly white writers exposed the ambivalent ethics of other- and self-care at the heart of the formation of the middle class. At Yale, I gravitated to courses on social class, the history of photography, and the culture of consumption. 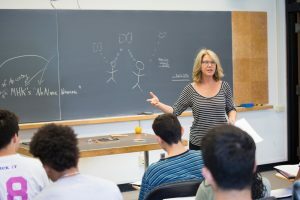 The creative, interdisciplinary approach of American Studies allowed me to continue the kind of work I had done at UC Santa Cruz as a Classics major, where I specialized in Greek epic and lyric poetry. As a Senior Lecturer at Williams, I enjoy the freedom to write outside of disciplinary and scholarly bounds. After turning one chapter of my dissertation into an essay (included in Sentimental Men, one of the first anthologies of essays devoted to the politics of affect in the U.S.), and organizing a high-profile session at the American Studies Association on the then newly-authenticated slave narrative of Harriet Jacobs, I focused most of my writing energy on poetry, the genre in which I’ve always felt most at home. In the ’90s, I was mentored and supported by poets Richard Howard, John Ashbery and Robert Creeley. Early publications in Southwest Review, Paris Review, Western Humanities Review and Seneca Review bolstered my confidence. I continued to write and to publish poems in many journals until I had produced a full-length manuscript that was named a finalist for several contests. After many revisions of that manuscript (as well as the parenting of four rambunctious children), my book, Four Weathercocks was published by Marick Press in 2016. Copies are available for the asking. Current projects include a book-length essay called “Poet/Tree” on trees in visual art and literature from Ovid to yesterday. How do artists express care for what is endangered, or already gone? Where does “caring” get us? The section on sculptor Charles Ray’s Hinoki (2007) — a life-sized copy in Japanese cypress of a fallen California coastal oak — is currently under consideration at a number of journals. My second volume of poetry, a manuscript entitled “Crash Course,” has as its core a set of poems about my recent experience with butoh, the severe and wildly expressive Japanese dance form. It’s more fun than it sounds. I expect this collection to be finished by the end of summer 2019. By rough estimate, I’ve taught well over 1,500 Williams students, many of whom have stayed in touch and are now my friends. In American Studies, I teach the core courses at every level, enjoying especially the introduction to the field. I am currently the Chair of American Studies. My favorite Winter Study course recently was Typewriters, documented in this short film: https://vimeo.com/291774897. For the past five years, I’ve enjoyed teaching the writing component of the Summer Science Program. In the English department, I teach a range of courses about U.S. literatures and writing, both creative and critical: Expository Writing, Personal Essay, Creative Nonfiction, and the new Introduction to Creative Writing in which we will move between fiction, poetry and nonfiction so as to decolonize genre, or at least to make lots of new writing. For me, teaching is always also a chance to mentor. I especially enjoy mentoring the first gen students and students of color who are drawn to my classes. As the daughter of a brilliant mom who did not go to college, I have a keen understanding of what it’s like to experience education as a gift that also divides. I welcome conversation with anyone about this. Being a good literary citizen means more than writing, publishing, and teaching. For the past ten years, I’ve served as the Poetry Editor of Tupelo Press (North Adams, MA), one of the top independent literary presses in the U.S. This job brings me into contact with hundreds of writers, and thousands of pages of others’ writing. Editing and helping to run literary workshops is another form of mentoring, draining at times, but also deeply rewarding. I also work as a reviewer of published poetry books. In addition to my work as a regular reviewer for Publishers Weekly (specializing in experimental poetry and work by writers of color), I write reviews for many of the most important literary journals in the country. When I’m not reading or writing or teaching, I’m playing Irish/French Canadian fiddle, or hiking with my husband (Jeffrey) and my two dogs (Tolo and Elsie), or talking via WhatsApp or HouseParty with one or more of my kids (who live in NYC, LA & Santiago, Chile). If you have the desire for some dog therapy time, drop by my office, Stetson 506! Review of my book, Four Weathercocks, by Jolene Brink, in jacket2. Review of my book, Four Weathercocks, by John Amen, in Colorado Review. Review of Vanessa Angélica Villareal, Beast Meridian, in online LA Review of Books. Review of Michael Wasson, This American Ghost, in Adroit. Review of Stephen Collis, Once in Blockadia, in Boston Review. April 12, 2019, poetry reading at Gramercy Books in Columbus, OH. 19th-century American literature, philosophy and culture (especially photography and architecture); personal essay/creative nonfiction; American poetry and music; inter-arts collaboration.